Heat oven to 350°F (325°F for dark or nonstick pan). In large bowl, mix cake mix, butter, brown sugar and cinnamon with spoon until crumbly; reserve 3/4 cup mixture for topping. Press remaining crumbly mixture on bottom and side of ungreased 12-inch pizza pan or in bottom only of ungreased 13x9-inch pan. In small bowl, beat sour cream and egg with spoon until blended. Carefully spread over crust. Top with peaches. Sprinkle with reserved crumbly mixture and the nuts. Bake 12-inch pizza pan 34 to 38 minutes, 13x9-inch pan 35 to 42 minutes or until topping is light golden brown and center is set. Cool 30 minutes. In another small bowl, stir glaze ingredients until consistency of thick syrup, adding additional milk, 1 teaspoon at a time, if necessary. Drizzle glaze over warm pizza. Serve warm or cool. Store covered in refrigerator. Fresh Apple Pizza: Substitute 2 medium apples, thinly sliced, for the peaches. Bake 38 to 42 minutes. 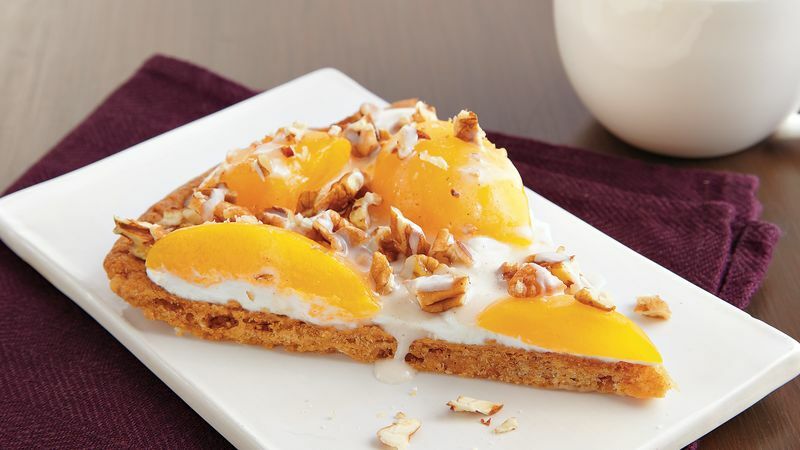 For a sweet ending to any meal, serve this fruity pizza with a scoop of vanilla, butter pecan or dulce de leche ice cream.